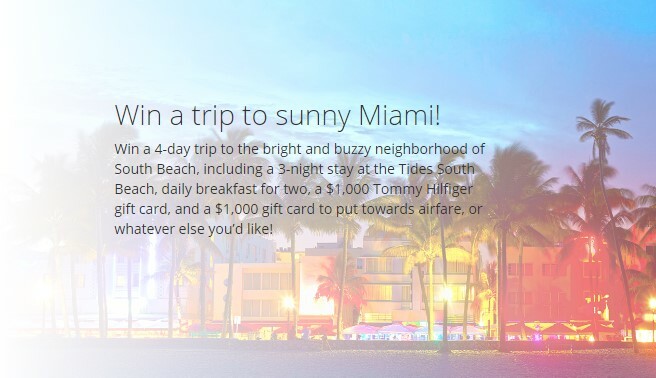 Tommy Hilfiger has teamed up with Jetsetter and they want you to enter once for the chance to win a trip to Miami's South Beach in Florida, plus a $1000 Tommy Hilfiger gift card and more! Grand Prize: Three (3) night stay at the Tides South Beach in an Oceanfront Premier with 1 King Bed, 650 square feet, guaranteed ocean view, corner junior suite. Includes Full American Breakfast for two (2) persons each day (up to a value of $25.00 per person per day) $1,000 Tommy Hilfiger gift card $1,000 Visa gift card. The approximate retail value of the prize is $3,800. This Sweepstakes ends on 06/01/16 and you can ENTER ONCE to win.